Well, the answer is simple. It’s the headline that motivates people into reading your content. It is considered to be one of the very simplest and effective ways to give a boost to your conversion rate. Headline goes way beyond the long blog posts you write. It should be the most important and crucial part of a write-up, as it represents the theme and idea of the whole article. According to Hubspot, only 43% of people skim through the content to find out what it is about. If your goal is to gain high clicks and a rush of traffic then you need to be laser-focused on the title of your pieces. Another source tells that 80% of people read the title to decide whether they want to read that particular article or not. Now it is clearly up to the writer, how he makes the headline effective enough to get clicks? That is why I’m writing this article to educate you all, how you can create catchy and attractive headlines. Solution selling is a very effective way of selling. We all are actively looking for the solution to our problems here and there. Identify the problems of the people within your niche and cater them with a unique solution. Proposing the solution to a problem via headline can produce you a significant increase in your conversion rate. But not just propose a solution in the headline but actually provide a solution to the problem in the content. Provide information which adds value to the user's knowledge. MarketingProf’s did a survey and observes a 28% increase in their conversion rate by utilizing this tactic. Who doesn’t like free things? I guess there is no such person who doesn’t welcome free things. For this very reason, you should consider utilizing the word “Free” into your headline. Highrise performed a test in which they added “Free trial” into their headline and observed a 30% increase in their conversion rate. If you serve any service or product for which you cannot afford to provide free trials you can always use phrases like most economical prices, low rates, etc. to gain the attention of the potential customers. This is another very effective technique to attract potential users towards your platform. Whenever we go online to buy something we always compare products from different platforms and analyze. Providing a well-researched comparison to the audience can get you great traction and can lend you hand in generating a high conversion rate. For example: Suppose you are selling or promoting a telecommunication company named Cox communications. You provide a thorough comparison of Cox internet packages with Mediacom Internet packages. 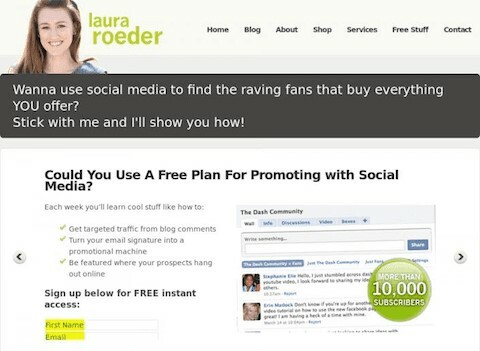 It’ll help people decide better and also will increase the engagement rate with your platform. Utilizing testimonials into the headline can prove to be very beneficial. I know it may seem a little unconventional but is really effective. 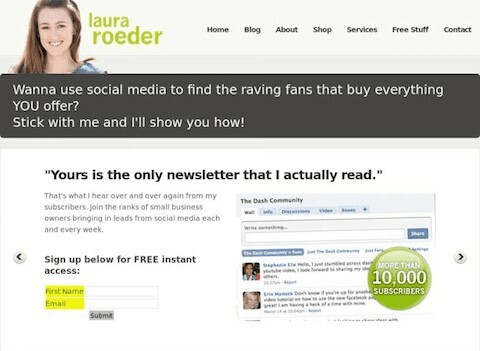 LKR social media performed an A/B test by utilizing testimonial into the headline, the results were exceptional. They observed an increase of 24.31% in the conversion rate. Whereas the original heading is shown in the photo below. And for A/B testing, they utilized a headline “Yours is the newsletter I actually read” resulted in a great success for them. Through this headline company made people believe that they are missing out on a lot by not reading their newsletter. Grow your business faster online! Online advertising tactics that work! Tips to get found faster on Google! All the above straight forward headlines worked really well for our platform. Whereas “Create a smashing website for your business” worked well than that of “Tips to get found faster on Google” and we received an 89% increase in the subscription rate. The catch here is that you don’t always have to come up with creative ideas to get yourselves benefit rather you can also play with very conventional ideas to utilize them to your benefit. Hit the curiosity cells of your users. I wrote an article back in my starting days when I was testing different things. It was titled “How to double your website’s traffic in a week.” Believe me, it was an instant hit and we received 5000 subscribers to our blogs in two to three days. That very day I realized that hitting the curiosity cells of readers can get you the traction you’ve been looking for the entire time. All you had to do was give them something to get curious about. I hope the article would have been of great help in devising effective yet intriguing headline which motivates people to read your content and convert. If you have any further questions leave them in the comment section below. « How Promotional Products Help Businesses To Advertise Their Products And Services?